While some may think a geriatric massage chair falls into the luxury category, it’s not. No matter how good a shape you’re in, age has a way of creeping up in the way of sore muscles, aches and pains, and stiff joints. So be it age or a medical condition, if you suffer from chronic pain a geriatric massage chair is a godsend. And as those who suffer will attest—not to mention those who suffer from insomnia—it’s an excellent alternative to taking drugs which can interfere with the medications you’re likely taking already. Continue reading to learn more. Despite its space-age design, it performs well with plenty of options. 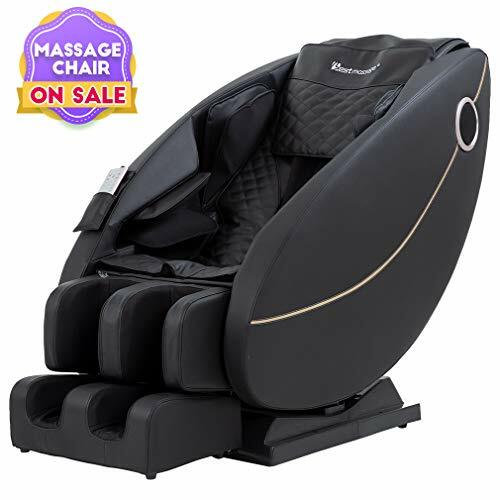 The BestMassage Full Body Zero Gravity Shiatsu Massage Chair has a surreal, space-age quality about it, which may put some seniors off, but that design helps conserve on space which is often a limiting factor with these purchases. It does come with rolling wheels which is helpful for maneuvering into place. It uses air pressure to deliver a gentle massage that can target your neck, back, feet, arms, and even hips. You have your choice of three levels along with a heat control for your back. The fact that the chair reclines is ideal for those suffering with insomnia in addition to chronic pain. Relaxation is the overriding theme with this product from its curved lines to built-in speaker, and multiple massage points. You can manage all the settings with remote control and can zero in on the areas where you need relief most which we appreciated. Though expensive, it offers plenty of massage options. 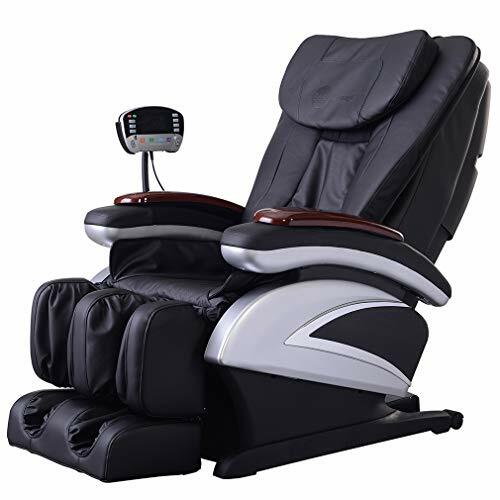 The Osaki OS4000 Executive Zero Gravity Massage Chair focuses on an area of particular concern among adults over 65. This age group accounted for 40 percent of health care spending in this category in 2013. This model is massive which limits its practicality, but it does come with a variety of features that help justify its high cost. It has five intensity levels, a timer, and back-targeted heat. There are eight pre-set programs to take the guesswork out of getting a massage and six massage styles including Swedish and shiatsu. We like the easy-to-use LCD for controlling the options of which there are plenty. It’s ideal for targeting specific painful spots. The Real Relax Massage Chair is just the thing for the more than 54 million American adults who suffer from chronic pain. This model feels less restrictive than comparable ones and also has the zero-gravity feature that we love. You can target the painful joints in your hands and forearms with the armrest linkage system. You can also direct a massage to your hips too. The chair comes with a remote control which you can configure. For example you can opt to leave the leg airbags off while the heat and massage are working your back. Its style is modern which may conflict with some decors, but it has a sleek profile. The product ships in two boxes with some involved assembly required. However, it includes detailed instructions with a YouTube video to walk you through the process. It’s a more affordable offering in this product category. 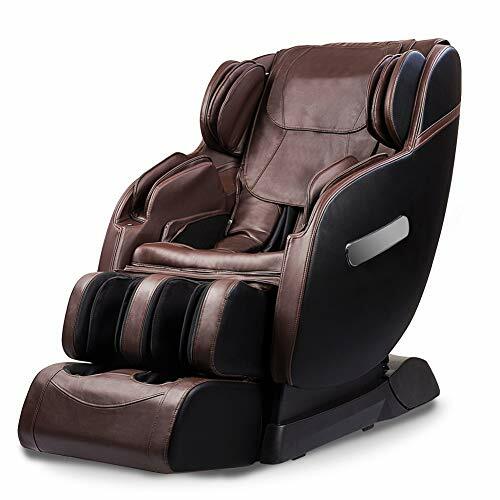 The BestMassage Electric Full Body Shiatsu Massage Chair resembles a standard recliner more than the other models we reviewed. It delivers four kinds of massage including shiatsu. It has heat to both your back and feet which we liked. While you can adjust the intensity levels, it is quite intense at the higher settings. And while not zero gravity, it does recline and comes with a sleeping mode. For seniors dealing with chronic pain the chair approaches the massage medically by moving pressure from the feet up, allowing the fluids that older people have problems with to slowly move towards the heart. We were impressed with the action directed at the calves and arms which we enjoyed. It uses air pressure with airbags well distributed throughout the chair. The chair does an excellent job of targeting your upper body. 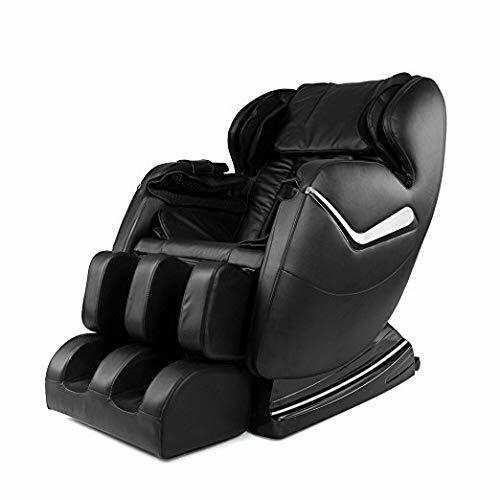 The Osaki OS-1000 Deluxe Massage Chair is a well-made model with plenty of support throughout its design. It has six pre-set programs which we always like to see in these products. It looks more like a conventional recliner and will fit in with most decors. The control resembles a TV remote and attaches to the armrest. While not zero gravity, it is comfortable and conforms well to the contours of your body. It does an excellent job of targeting your shoulders which we appreciated. We especially like the fact that you can get free in-home service for one year with the option to extend it to two or three years if you prefer. This chair has an appropriate name given the comfort it provides. Robot Hand rollers work together with SL-TRACK, move from neck to hip( up and down modes). Arms are upgraded vertical wraparound airbag massage, more ergonomic design. The 3D Robotic SL-Track Real Relax Massage Chair is another offering that has that modernist feel about it that you’ll either love or hate. It has body scan technology to adjust the rollers to fit your shape for optimal performance. You can go from sitting to zero gravity with just a push of a button for instant comfort. It has six massage types along with a sleep mode which we loved. The hip and foot massages are quite relaxing and there is one heat source directed at the lower back. It also has a wrapped-arm design to target the arm areas if you have arthritis. Overall, it delivers beyond our expectations even if it’s on the costly side. It gives you an excellent massage, making it a decent value for the price. 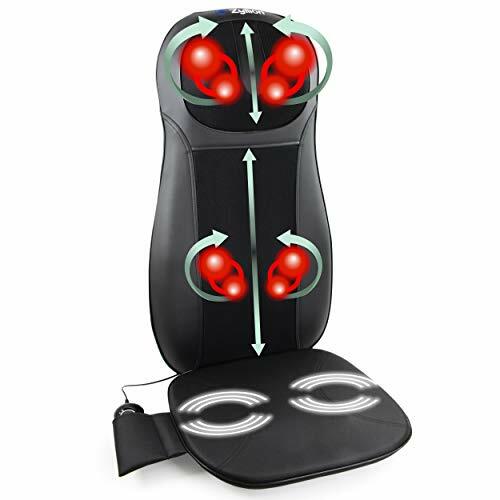 The Zyllion ZMA14 Shiatsu Neck & Back Massager Cushion is an excellent value for the price and gives you the comfort of a massage while on the go but not breaking the bank in the process. It has many of the features you’ll see in more expensive models at a fraction of the cost. There are four shiatsu massage levels for targeting either your neck or back regions. There is vibration for your backside too. It has some safety features including an automatic shutoff and overheating protection. There are three levels of control with heat throughout the cushion and it has an adjustable strap to attach it in place wherever you’d like to use it. We like this option for seniors who have family and friends scattered over the country and/or do a fair amount of traveling. The Zyllion Shiatsu Neck & Back Massager Cushion allows them to take some comfort (and relief) with them while they travel. We’ll consider each factor along with some tips about what to look for and avoid. The kind of massage chair plays a significant role in the other things we’ll go over. The latest technology offers a zero gravity design which gives you the sensation of floating. The advantage is that it takes all the stress off of your joints and muscles to provide some welcome relief. You’ll also see models with air pressure which provides a more gentle experience and counters some of the issues with the roughness that some have with roller designs. You’ll see products that target different parts of the body with contoured features and sleeves. They offer a massage that covers the entire area. Heat is often a standard feature of these products since it’ll increase circulation and relax your muscles. That can make a massage more enjoyable and useful. Pay attention to the type of control you have over the temperature. Some can become quite warm, increasing the risk of burns. Also, check the distribution of the heat, noting if it’s just on your back or all through the chair. As you’ve seen, massage chairs come in a wide variety of sizes from portable to unwieldy. The larger ones are usually bigger than recliners because of the added mechanical features. They’re also heavy. Once you put it somewhere, it can be an ordeal to move it someplace else. As with any piece of furniture, it pays to take some measurements before you buy to save you the hassle of a return. Make sure to allow for plenty of room around it, especially if the footrest extends away from it. Another thing to consider is how easily you’ll be able to get out of it. Some models are quite deep which can make standing up more difficult. We’d suggest reviewing the return policy on the product along with any costs associated with it, just in case, it doesn’t work for you. 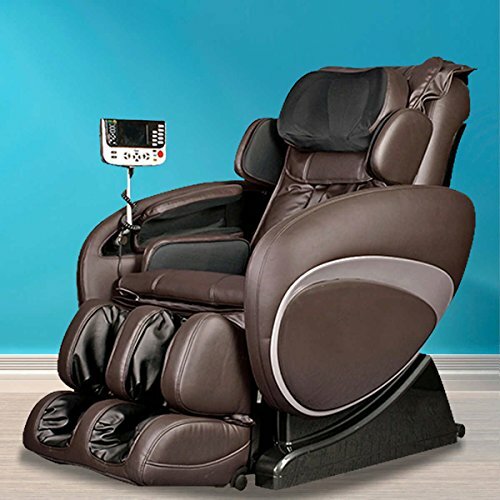 The price ranges of the best massage chair are all across the board. It tends to follow the familiar mantra of getting what you’ve paid for typically. The expensive ones will prove comfortable. However, the more bells and whistles you add, the higher your cost. The products sell themselves, so we recommend setting a budget before you start looking—and trying—them. You might find the idea of getting a massage whenever you want it attractive. However, there are both advantages and disadvantages of this practice for which to be aware before you buy. We’ll review both sides to give you a better perspective. There’s no denying that a massage is relaxing and sure to relieve stress. And the fact that you can get one without leaving your home is a plus. And if you have trouble sleeping at night, it can offer an excellent way to ease you into the proper state of mind. It’s not uncommon for these issues to occur in seniors, making it a wise investment. And if you’re taking a beta blocker to treat your hypertension or glaucoma, using a chair that provides heat is an effective way to counter the coldness you may feel in your hands and feet, a common side effect of these drugs. However, there are several cons that you’ll need to consider too. Most evident of these points is the cost, especially when looking at deluxe models. Of course, you’ll likely find the best massage chair at the high-end of the spectrum. Undoubtedly, you encountered sticker shock when viewing these types of products. From a medical standpoint, you should not use one if you’re taking a blood thinner because it can affect your circulation and interfere with the efficacy of your treatment. Also, it is not a safe choice for individuals with osteoporosis because of other health risks. We strongly urge you to discuss this purchase with your doctor if you are on any prescription medications or have a pre-existing medical condition. We know the aches and pains that accompany aging, much less aging in place. Not to mention possible medical conditions or diagnoses. The best massage chair will target sore spots on your body and deliver welcome relief from the pain and anxiety they cause. As you’ve seen, there is a wide range of products and price points. If your health permits it, you may find buying one a wise choice.